This classic guide explains how to craft compelling messages and powerful proposals that attract prospects' attention and speak to their needs. 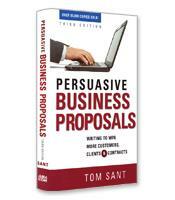 With clear instructions as well as before-and-after samples, "Persuasive Business Proposals" takes readers step-by-step through a highly effective process for writing customized packages that capture new business. The process for writing customized proposal packages that capture new business. New ways to "power up" cover letters and executive summaries. How to overcome "value paranoia." Effective strategies for dealing with automated procurement systems.